The European Union celebrates its 50th anniversary this year, but the prospect of a united Asia still seems a long way off. 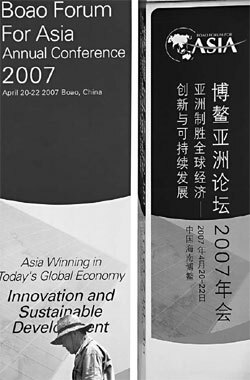 Discussions about integrating Asia began appearing in the media in the late 1990s. A worker walks past a Boao Forum billboard. The annual conference on Asian development is being held this weekend on the island province of Hainan. The devastating 1997-98 Asian financial crisis led many nations in the region to consider closer cooperation. The success of the single European currency set a good example for successful economic integration. However, experts were quick to point out that development-level disparities among Asian economies meant that European-style integration would not be seen in Asia any time soon. It is inconceivable, at least at the moment, that Asian countries like China and Japan would forsake their independent monetary and fiscal policies for a common one, they said. "Countries in Asia ... are a long way from the economic convergence that you would need to make monetary integration a realistic possibility," said David Burton, director of the International Monetary Fund (IMF)'s Asia-Pacific Department. Long Yongtu, secretary-general of the Boao Forum for Asia, said the continent needed at least 50 years to achieve economic integration. It is thought that Japan and China, the two biggest economies of Asia, should play major roles in any form of Asian integration. However, relations between the two have been in a sour state for about five years and began to thaw only recently. Bumpy Sino-Japanese relations illustrate that obstacles for Asian integration are not only economic, but can also be political and cultural. Despite the difficulties, headway has been made in different areas and at different levels. The number of free trade agreements (FTAs) among economies in the region has continued to grow. Signatories to the Chiang Mai Initiative are considering broadening its scope. The initiative was set up seven years ago to enable East Asian economies to forge currency swap deals to tap each others' financial resources in the face of heavy speculation. And sub-regional integration such as the Great Mekong program has also been making progress. None of these developments were breakthroughs, but all of them point to closer regional cooperation. Long said in addition to pursuing FTAs, Asian countries should deepen their cooperation on infrastructure, human resources, energy and environmental protection. On the financial front, integration that can be pursued at the moment includes that of financial markets, improving and putting in place common regulatory frameworks and trading platforms across the region, said the IMF's Burton. "Those sorts of things are ongoing and are realistic possibilities," he said. Long said discussions about Asian integration have mainly been about East Asian integration, and more attention should be paid to connections between East Asia and South Asia, West Asia and Central Asia.